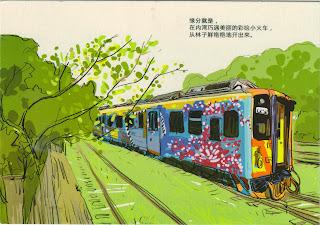 Postcard TW-1123145 from Taiwan shows a colorful train running on the Neiwan Line (內灣線), a railway branch railway line in Hsinchu County, Taiwan. The line was constructed in 1950 and was fully open on September 11, 1951, with a length of 27.9 km and 14 stations from Hsinchu to Neiwan. It became a popular tourist attraction in the early 2000s.